In 1946, Van Fleet was sent to Greece as the executor of the "Truman Doctrine," and he was instrumental in the outcome of the Greek Civil War and the struggle against communist insurgents by providing advice to the Greek government and 250 military advisers, as well as administering $400 million in military aid. The Greek Army had completely routed the commmunists by the end of 1949, forever making General Van Fleet a hero to the Greeks. From Greece, General Van Fleet went to lead as the eighth army commander in the Korean War. The central square in the northern Greek city of Kastoria has featured a bust of Van Fleet for many years, and was replaced with a new statue as recently as 2007. Interestingly, in 1953 the Greek Independence Day Parade in New York took place on April 4th, which was Holy Saturday, the day before Easter in both Eastern and Western Churches that year. 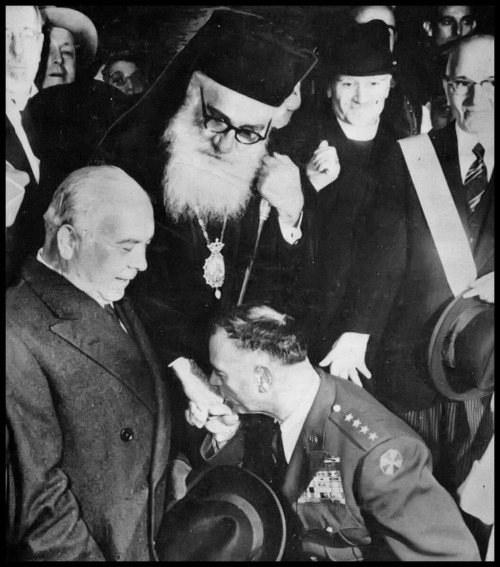 That night General Van Fleet attended the Easter Vigil at the Greek Orthodox Cathedral of the Holy Trinity, presided over by Archbishop Michael, where a special tribute was made for American aid to Greece against communist forces. About the service, General Van Fleet said: "I've attended many Easter services in Athens and Greece, and I'm attending this one as a courtesy to the archbishop."